In “Hi, Robot” we looked at the growth in artificial intelligence software to automate not only mundane and repetitive tasks, but also increasing complex situations. But there is another growth market for robots: mobile telepresence devices that help people move about, see, hear and speak in a distant location through a set of screens, cameras, speakers, and microphones mounted on mobile platforms. 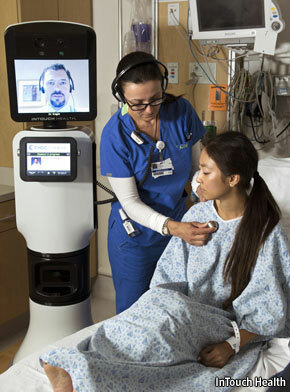 For example, a doctor can now consult on a patient on the other side of the planet through use of RP-VITA, a telepresence robot co-developed by iRobot of Bedford Massachusetts and that was approved for use in U.S. hospitals in early 2013 (see below). Several start-ups are introducing new telepresence robots this year, and sales are growing as costs fall. RoboDynamics of Santa Monica, California, for example, has sold more than 100 of its $10,000 TiLR robots since 2008; its sleeker Luna model went on sale in January for $3,000, and its proposed 2015 model is expected to cost less than $1,000. 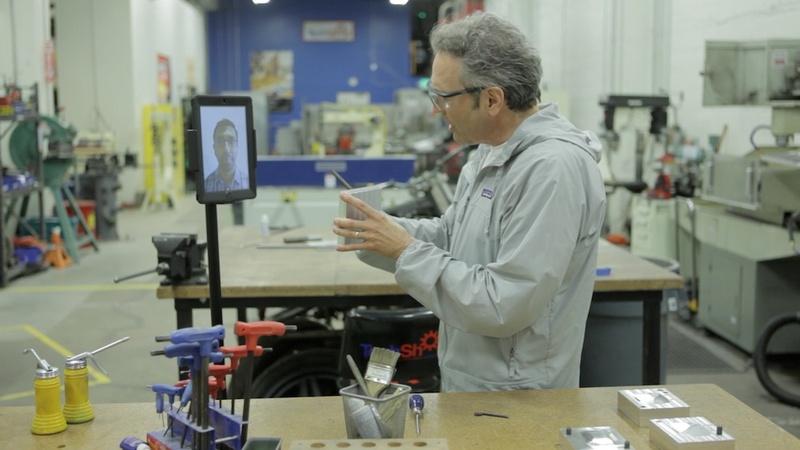 Businesses commonly buy telepresence robots to inexpensively bring distant employees back “into the fold” at the office, says Fred Nikgohar, the company’s boss. Later this year a Pennsylvania start-up called Bossa Nova Robotics will start selling a 1.37-metre-tall telepresence “ballbot” called mObi that rolls around on a football-sized sphere, a design which enables it to weave through cluttered offices and turn on a dime. 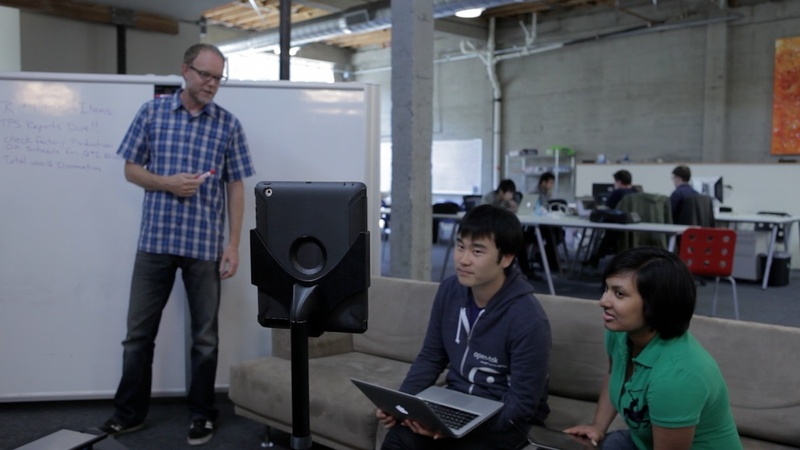 Telepresence robots are not just for office workers, however. They also let homebuyers tour distant properties virtually, allow doctors to conduct bedside consultations from afar and provide a cheap way to patrol workplaces at night. Oculus, a robot used mostly for security patrols, is essentially a set of wheels for a laptop running Skype videoconferencing software which can be controlled using a smartphone. Made by Xaxxon Technologies, based in Vancouver, it costs $290. Some globe-trotting parents have even begun using robotic telepresence systems to stay in touch with their children at home. Brazil’s Olympic Organising Committee will put telepresence robots in operating rooms for the 2016 games in Rio de Janeiro. João Grangeiro, the committee’s chief medical officer, says this means that doctors unable to accompany their athletes to the games will be able to advise Brazilian surgeons during operations. Even sluggish regulators and hospital bureaucracies in eastern Europe and Russia now want the kit, partly because late-night visits from remote doctors keep tired staff focused, says Svetlana Karpova of Baltic Consilium, a consultancy to hospitals and health ministries that is based in Britain. Robots were virtually absent from Russian hospitals several months ago but will probably be in more than 30 of them by the end of this year, she says. They are also useful at hospitals in big, wealthy cities such as London, where emergency specialists sometimes get stuck in traffic and may not otherwise reach patients fast enough.